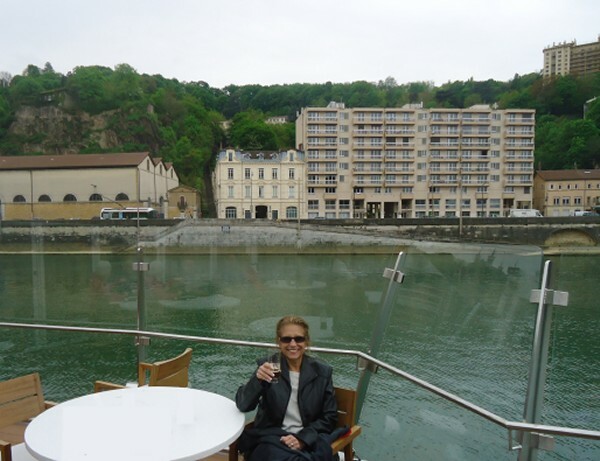 People ask me how a river cruise is different from an ocean cruise. Having been on five previous river cruises, the most obvious difference to me is the view from your room. A balcony view on an ocean cruise is like a screen saver. You see the same ocean all day long. Not so on a river cruise. There is always something new to see out your window... mountains, castles, vineyards, forests, rolling countryside, farms, villages. A river cruise is like taking a long cross-country trip in an RV, except that we use a river as our highway. Rivers are much better than highways. No traffic, no billboards, no noise. Very pleasant, very relaxing. There are those who worry about getting seasick. Not a problem on a river cruise. The inland rivers are smooth as glass. Worried about your ship sinking? Don't bother. If there's a fire or some problem, jump in the water and dog-paddle to shore ten feet away. In some places the river is shallow enough that you can even walk to safety. To me, the major difference is the objective. An ocean cruise tries to thrill you, entertain you, give you a wide choice of things to do. There are shows at night, music events, gambling, dancing, game rooms, exercise rooms, rock walls, trivia contests. A riverboat does not have room for all that, so the emphasis changes. A river cruise concentrates more on education. What is it like to live in the land you are visiting? What are the politics and the history? For example, at some point on the Russia Cruise, you will have the chance to visit a family who will recall what it was like to live in Communist Russia. The visit might make you squirm, but it will also be informative. An ocean cruise is like a buffet. You see a little of this and a little of that. A land trip, say a trip to Italy, is nice, but you live out of a suitcase and have a different hotel room every night. A river cruise is the best of both worlds. You can totally immerse yourself in a certain area of the world via a floating hotel. 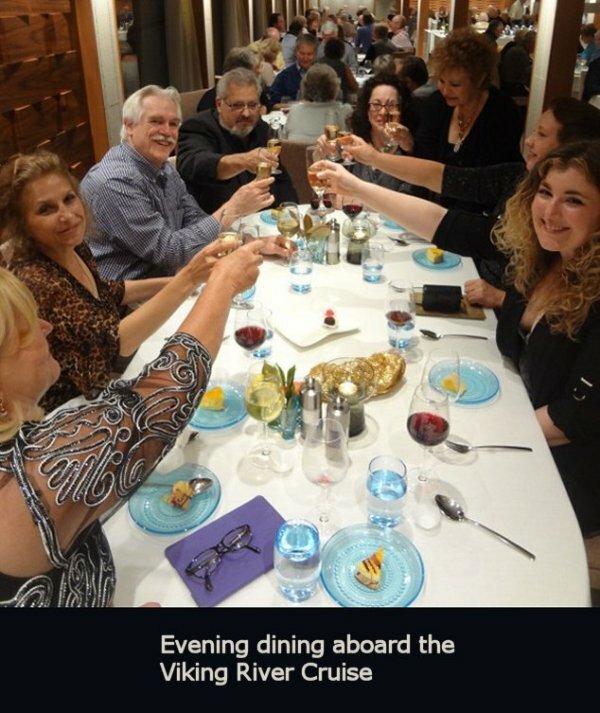 Dinnertime on a river cruise is a definite highlight. The meals are exquisite, the complimentary wine is plentiful, and the dinner conversation tends to be full of laughter and merriment. 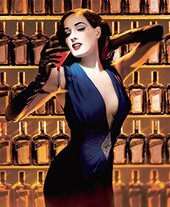 Afterwards, head upstairs to the lounge and have yourself a Vodka or a Martini with your pals. People ask if there is dancing and the answer is yes. They have a modest dance floor in the lounge and a musician to take requests. 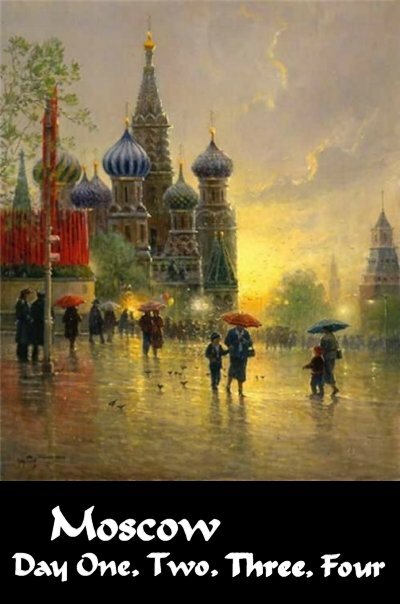 At this juncture, April 2019, Marla has registered 34 passengers for our 13-day river cruise to Russia in mid-June 2020. Never before have we received such strong preliminary interest in a trip so far off in the distance. Considering Marla set an attendance record for this river cruise simply through word of mouth, I asked myself why this trip is so popular. I came to the conclusion that River cruises can be addictive. It is phenomenal the number of repeat customers Marla has. After our 2018 Dracula on the Danube River Cruise to Romania, 67% of our guests signed up for the upcoming Russia trip even though it was two years away! Russia just happens to be next in line to cross off our list. There will be plenty of highlights at both ends of the trip... St. Basil's Cathedral, Boshoi Ballet, the Kremlin, Red Square, Hermitage, and Peterhof Palace. But don't underestimate the river portion of the trip along the Volga. You will love the view of the Russian countryside from the vantage point of your Viking riverboat. You get to sit back, put your feet up and imagine what is really like to live in this strange land. Maybe it is as simple as the lure of vodka, caviar, nested dolls, balalaika music and Russian folk dancing. But I thinks it goes a little deeper than that. Our group has hit a special time in life when we have the time, the resources, the health and the incentive to see as much of the world as possible. A river cruise is one of the most pleasant ways imaginable to do just that. 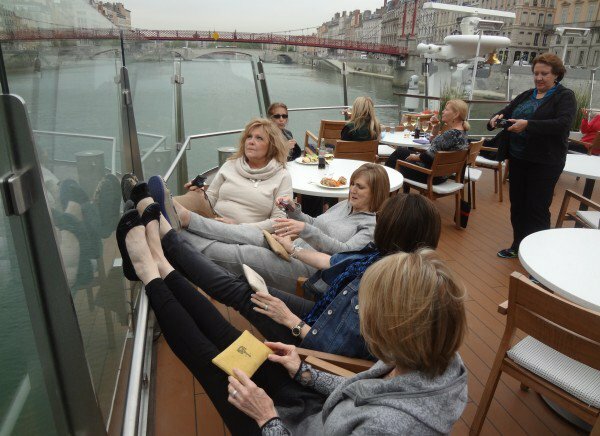 It is not a stretch to say a river cruise is a rocking chair vacation. I can personally attest to the joys of sitting in a rocker watching the world go by. Our trip spends most of its time along the legendary Volga River. Known as 'Mother Volga' in the homeland, there is an unmistakable reverence for this amazing river. It is by far the longest river in Europe. Unlike the Danube where the Viking ship remains on one river for the entire trip, our Russian river route is much more complicated Forced to transfer from one waterway to another, hopefully our captain is paying attention. If we take a wrong turn on the Volga, we will end up in the Caspian Sea. Next stop Iranian jail being tried as American spies. Fortunately this is highly unlikely since the captain will have about 1,000 miles to catch his mistake. Our aquatic path has a name... the Volga-Baltic Waterway. It starts in Saint Petersburg and ends in Moscow, or in our case the other way around. As an avid proponent of naval power, it was the lifelong dream of Peter the Great to have a port on the western edge of Russia. The moment he laid eyes on the soggy marshland where the Neva River meets the Gulf of Finland, Peter found his spot. Only one problem... Sweden owned this territory. No problem. Peter started a four year war to grab the Gulf of Finland. After the war was won, Peter said, "Let's build a city!" Immediately the engineers protested. "Sir, it is sheer folly to build on mud and quicksand. There is no way this swampland will support any kind of structure whatsoever!! Any work we do will be washed away by the Neva floods." Peter merely smiled. "Gentlemen, we are a poor country, that is true. However there are two things which Mother Russia possesses in abundance... dirt and slaves. Put the serfs to work filling in the swamp." Peter was undeterred because he knew what he was talking about. During his European Tour five years earlier, he had fallen in love with Amsterdam. Amsterdam was built in a river delta area similar to the mouth of the Neva. The Dutch had brilliant engineers who knew just how to reclaim land from the sea. With 60 miles of canals, 90 islands, and 1,500 bridges, this Dutch city was now famous throughout Europe for its exquisite canal system. Thanks to his unforgettable experience, Peter fashioned his new city in the image of Amsterdam. He named it 'Saint Petersburg'. 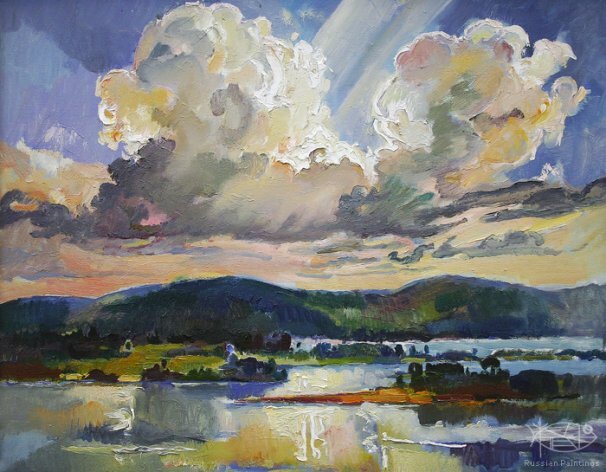 After his city was completed, Peter then created the Ladoga Canals in Lake Ladoga. Finally Russia had a secure means of river transport from the Baltic Sea into the Russian hinterland. Unfortunately, the waterway stopped there. However, the Russians were not done yet. In addition to slaves and dirt, Peter should have added that Russia also had lots of water. Just beyond Lake Ladoga was Lake Onega. Just past Lake Onega, there were more lakes galore within tantalizing reach of one another. Like a connect-a-dot puzzle, these giant lakes were begging to be linked together. All that was needed was a canal here or a river-widening there. Over the next couple centuries, there were a few projects, but nothing on a grand scale. Leave it to the paranoia of Joseph Stalin to solve the problem. Suddenly there were countless political prisoners. What to do with them? In the Thirties, 200,000 gulag prisoners under the direction of Soviet secret police created the Moscow Canal linking the Moskva River to the Volga River. Now for the first time, Moscow had river access to five different seas: the White Sea, Baltic Sea, Caspian Sea, Sea of Azov, and the Black Sea. Moscow became known as the "Port of the Five Seas". Pleased with the results, the Soviets said why stop here? At a great cost of human life, they put the political prisoners to work digging more canals. Soon enough, Lake Ladoga was connected to Lake Onega, Lake Beloye, the Rybinsk Reservoir and the Volga River. Behold, the Golden Ring of Russia was completed. A system of rivers, lakes, and artificial waterways formed a giant loop allowing riverboats to access an unlimited number of cities. At the time, it is highly unlikely that Stalin or any of the later Communist leaders ever envisioned tourism. 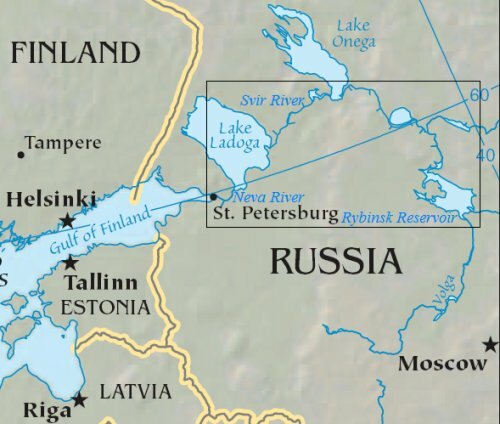 However, with the thawing of East-West relations in recent years, the Volga�Baltic Waterway has gained additional importance as a unique tourist route for boats sailing along the Golden Ring of Russia. Mother Russia has finally put out the welcome mat. Day One is basically a day to recover after the trip from Houston. Once you arrive in Moscow, you will be transferred to your ship which will serve as your hotel during the four-day stay in the city. Since most people are tired after the long flight, there is nothing scheduled. You will have free time to relax before dinner. You are welcome to walk around, but things won't get going till the afternoon. Relax, kick back in the morning, have a leisurely breakfast and enjoy an early lunch. The afternoon features a half-day tour of Moscow. See the famed Bolshoi Theater and stop at Red Square for a view of the brightly colored St. Basil's Cathedral and a visit to the famous GUM Department Store. You also get the chance to experience the city's Metro. Stay in the city center for an evening performance of traditional Russian folkloric music. Today you have a full day to further explore Moscow's many buildings, parks and monuments. Or you may choose an optional experience: Take a morning tour to Tretyakov Gallery, the world's foremost museum of Russian fine art. This afternoon you may visit the Cosmonaut Museum with displays that trace the history of space exploration or take a Jewish Moscow tour, illustrating the history and spirit of the Jewish people who settled in the city. 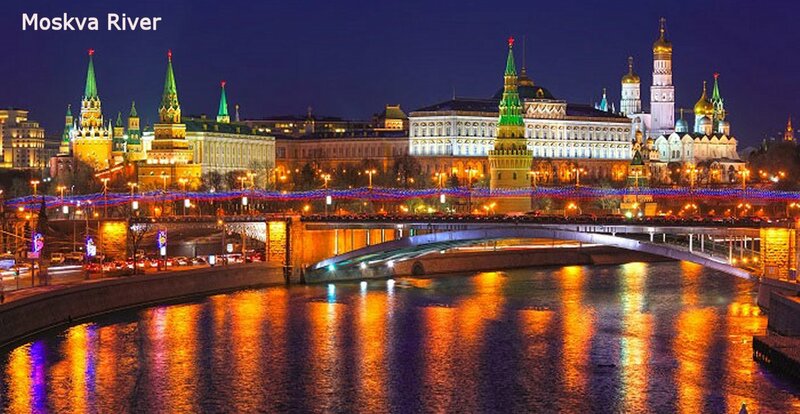 Dine on board for dinner, then relax or take an optional Moscow by Night tour. After breakfast, we travel to the city's famous red brick enclosure known as the Kremlin. We will have a chance to go behind its walls to see historic gems like Tsar's Canon and Tsar's Bell, and tour inside two cathedrals. In the afternoon, sit back and enjoy a scenic cruise along the Moscow Canal as we depart the city to begin our trip on the Volga River. We cruise the Volga throughout the morning. 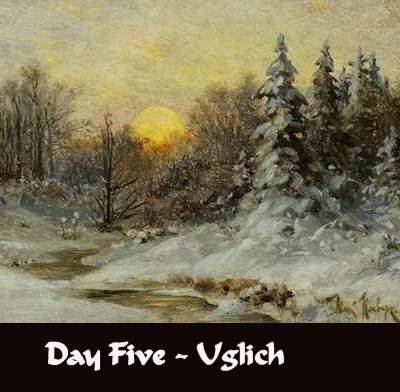 After lunch, you will disembark for a walking tour through the provincial village of Uglich. Uglich is one of the Golden Ring cities that preserve the memory of Russia's historical events. 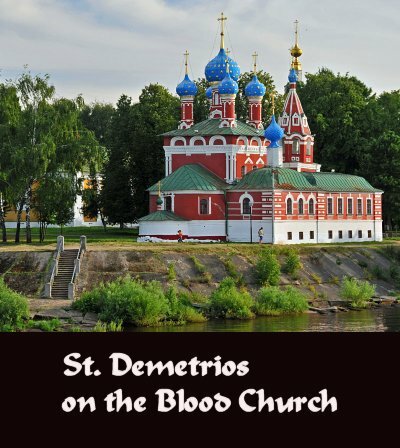 See the former Kremlin of Uglich and visit the Church of St. Dmitry on the Blood, built on the site where Ivan the Terrible's son Dmitry was mysteriously killed. We will visit a local family at their home for tea and friendly conversation. Be sure to practice your Russian in advance (just kidding). We arrive this morning in Yaroslavl. This will be our second Golden Ring city. Tour this ancient town rich in monuments and visit the covered food market, where you may shop for handcrafted souvenirs. Nested dolls are sure to catch your eye. During your free time, you may visit the Church of St. Elijah the Prophet, featuring detailed frescoes and icons. Return to your ship for lunch and departure. We dock in the morning at Kuzino, our third Golden Ring Russian village. Today you will visit the renowned Kirillo-Belozersky Monastery, founded by Saint Cyril in 1397. We will take a guided walk through the monastery's historic grounds, seeing several small wooden chapels, the Assumption Cathedral and a museum. 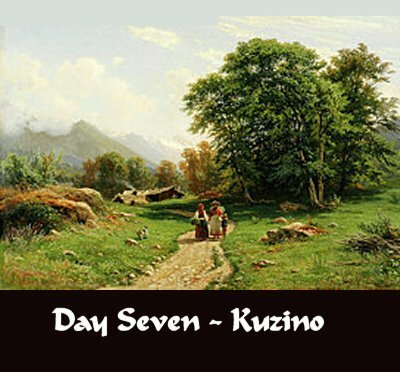 You will also have the opportunity to visit a children's school in Kuzino or the local Merchant House. Return to your ship for lunch and an afternoon departure. 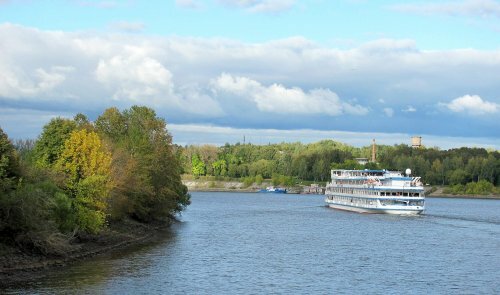 We will spend the remainder of the day on a leisurely cruise along the Volga-Baltic Waterway. 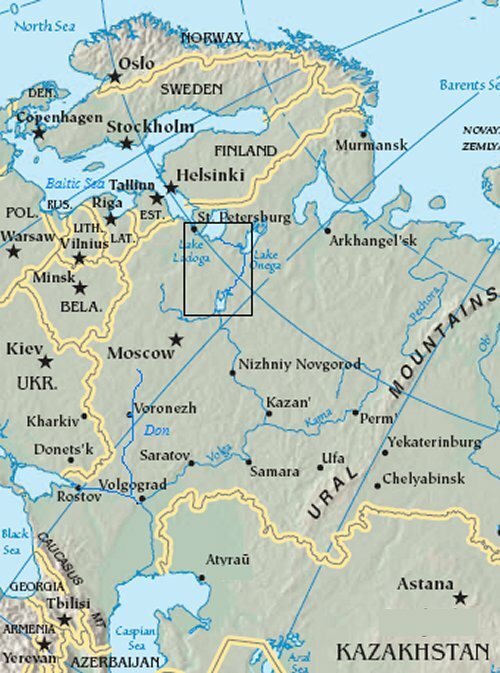 This is a system of rivers and canals that links the Volga River with the Baltic Sea. The length is 229 miles and comprises seven locks. The morning sees our ship sail through the tranquil waters of Lake Onega, Europe's second largest lake. 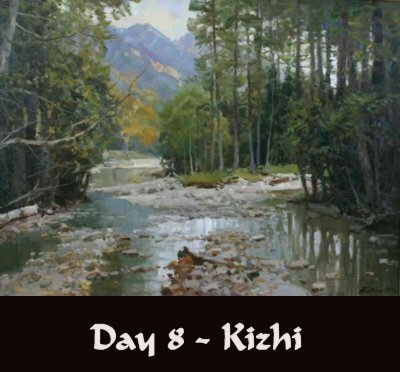 In the afternoon we will arrive at the island village of Kizhi. From here we will set out on a walking tour through the Open Air Museum of Architecture, a UNESCO World Heritage Site. Our visit will take us to a collection of wooden houses, windmills and churches. 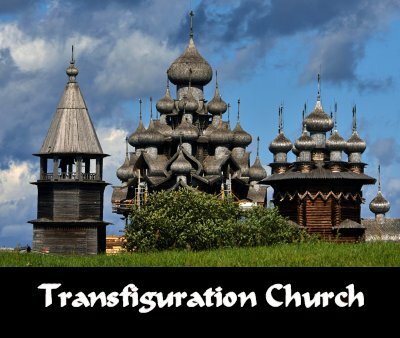 Our tour will be highlighted by the 3-tiered Preobranzhenskaya (Transfiguration) Church. This fairy-tale structure was built in 1714 without a single nail. We depart in the evening and cruise through the night. This will be a relaxing day as our ship cruises Russia's intricate waterways. We will traverse three different bodies of water. Our first route takes us along the scenic Svir River. We will travel the 139-mile "Blue Route" heading southwest from Lake Onega. 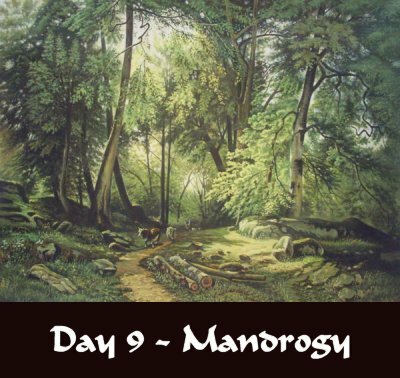 We stop in Mandrogy and take some time to explore this museum village. Visit the Vodka Museum or shop for handmade Russian craft items. If you wish, take an optional visit to a 'banya', a traditional Russian bath house. Or, if you prefer to stay on board, watch and participate in the art of 'matryoshka' doll making. Later we continue along the Svir, then cross Lake Ladoga, Europe's largest lake, on our way to the Neva River. All three of our meals will be served aboard your ship. .. 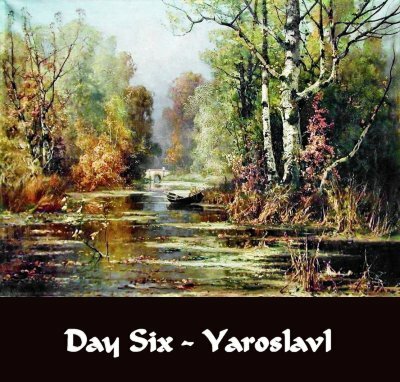 It has been a long journey, but today we complete the final leg of journey down the waterways of Western Russia. We will sail on the Neva River into St. Petersburg early this morning. After a leisurely breakfast, our first adventure will be a visit to the Winter Palace. 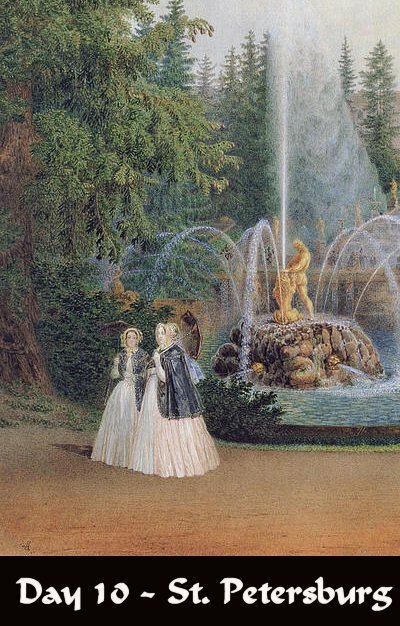 For you art lovers, this will be quite a treat because you will have a chance to tour the legendary Hermitage Museum. You will be amazed at this marvelous collection of art, antiquities, jewelry and sculpture. However, save some energy. After we return on board for an early dinner, our evening will be highlighted by a performance of traditional Russian ballet. Today's excursion goes to the Pushkin area. Here you will visit Catherine Palace, the elegant rococo 18th-century summer residence of the Russian tsars. No, this is not named for Catherine the Great, but rather Catherine I, the widow of Peter the Great. Tour the various halls, including the storied Amber and Agate Rooms, and see the ornate decor throughout. We return to your ship for lunch. After lunch, it is time for a city tour. We will see noted sights including St. Isaac's Cathedral, Peter & Paul Fortress and Nevsky Prospekt. Dine on board, then relax. If you wish, you can attend an optional evening folkloric performance. 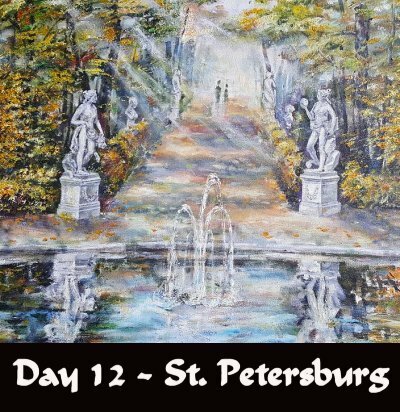 Or perhaps even venture into St. Petersburg on your to see what you might discover. You have the day free to see the sights that interest you. Visit one of the many palaces, churches or museums. 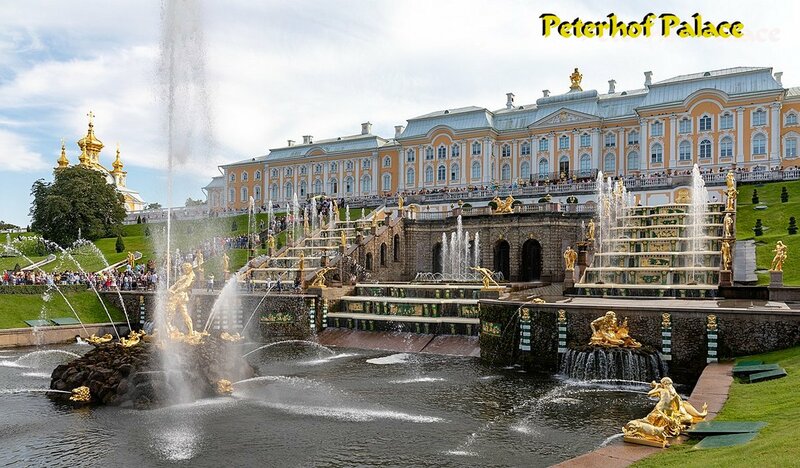 Be sure to consider taking the the optional morning tour to Peterhof Palace, a spectacular estate with landscaped gardens and beautiful fountains. In the afternoon, you may choose to join an optional kommunalka visit to get a glimpse of these communal living spaces. 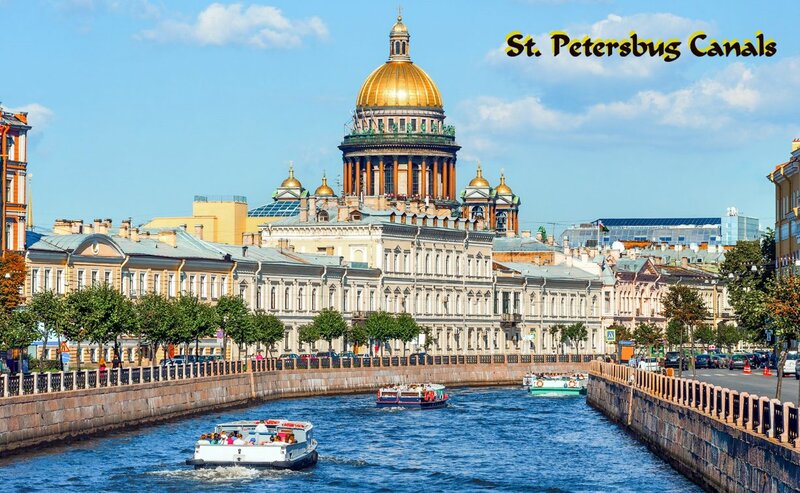 Another suggestion is to take an optional tour of St. Petersburg from the water. Lunch and dinner are served on board. 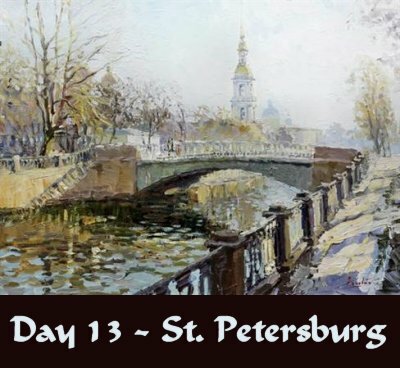 If you wish, you may extend your voyage with 2 additional nights in St. Petersburg. This will give you more time to explore this magnificent city. Another option is to journey to nearby Finland to enjoy 3 nights in beautiful Helsinki. However, if you must return home, after breakfast you will disembark and proceed to the St. Petersburg airport for your return flight. Thank you so much for sharing these past two weeks with us. 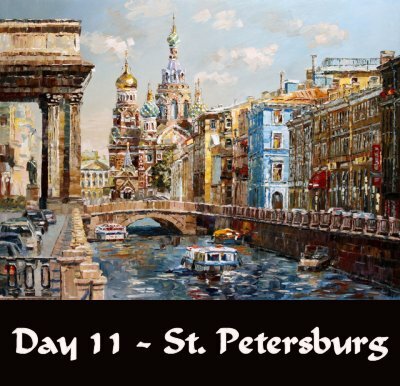 Marla's Notes: Viking's Waterway of the Tsars-13 day trip June 10th -June 22nd, 2020, includes FREE AIR from Houston. (This current Air Promo extends to 4/30/19. All of this is included in the price. � VERANDA AX UPPER DECK (225 SQ. FT.) $7274 P.P. � RIVERVIEW CX MAIN DECK (160 SQ. FT.) $6174 P.P. � RIVERVIEW DX MAIN DECK (140 SQ. FT.) $5874 P.P.